I wanted to play the guitar long before I actually had the means to start playing. My parents had already put me through 8 years of piano lessons and 4 years of trombone lessons so I was on my own when it came to the guitar. I had to get a summer job when I was 17 and earn enough money to buy my first electric guitar. From the beginning I was interested in using alternate tunings because I was listening to a lot of Sonic Youth and no wave music. I didn't know how to play, so starting out with alternate tunings seemed natural because you have to figure out your own way of playing within the tuning. I really enjoy the moments when I get to present my film works and music in tandem. I feel that they are very interconnected and presenting my work as an audio-visual experience feels like a complete representation of my creative voice. I finished recording my new album last summer in Austin and my main challenge was balancing new instrumentation with the aesthetics of Noveller. 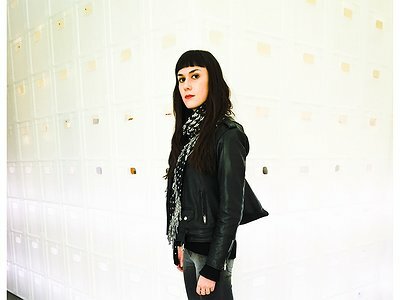 I wanted to incorporate more synth and piano and other sounds without destroying the integrity of Noveller as a guitar-based project. I love the result. I usually start with playing my guitar unamplified. It challenges me to not rely entirely on my effects pedals to write new pieces. I like to draw inspiration from improvisation but try to keep it separate from composing. Do you feel it is important that an audience is able to deduct the processes and ideas behind a work purely on the basis of the music? If so, how do you make them transparent? No, I don't think this is important to me. I think that music is about communication and the way that we communicate is certainly influenced by our cultural background as well as many other factors. Personally, I feel like personality plays a bigger role than cultural differences. I define my myself as an introvert and I think that that maybe has more influence on my creative process and my perception of art than anything else. I feel like personality plays a bigger role than cultural differences.